Mickey Marcus (1901-1948) - Colonel David Daniel Marcus, nicknamed "Mickey Marcus," was an American and Israeli soldier and war hero. Marcus was born February 23, 1901* in Manhattan's Lower East Side to Romanian Jewish immigrant parents, Mordechai Marcus and Leah (nee Goldstein). David was the fifth of six children. Marcus's father was a pushcart vendor. The family soon moved to Brooklyn, but in 1910, Mordechai Marcus died of a heart attack. David's older brother Michael was athletic and fearless, and became a leader of a self-defense group he formed to protect. of elderly or weak Jews. Little David Marcus followed his brother Michael around and soon acquired the nickname "Little Mike" and then "Mickey." He grew up in the mold of his brother, excelling in athletics, as well as being a good student. 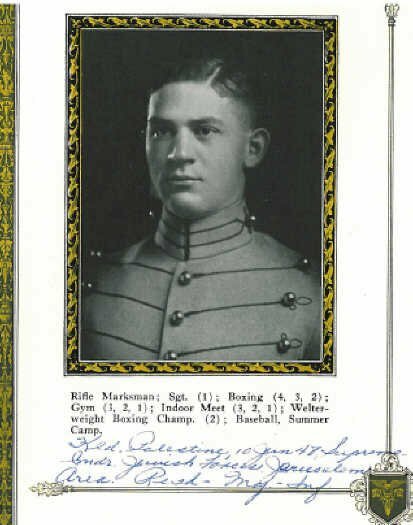 Marcus entered West Point Military Academy in 1920, against his parents' wishes, and graduated in 1924. His first assignment was on Governor's Island in New York, permitting him to study law in night school. At this time, he also married his wife, Emma Hertzberg. In 1927, the army proposed to assign him to Puerto Rico. Marcus and his wife decided they did not want to live there. Marcus left the army and went to work as a law clerk. He continued his studies in night school and received a doctorate from Brooklyn Law School. He became Assistant U.S. Attorney in the Southern District of New York. In 1934, he joined the New York City Correctional department when Fiorello La Guardia was elected mayor of New York. David Marcus distinguished himself by leading a raid to clean up the corrupt Welfare Island prison and working with Thomas Dewey to convict "Lucky" Luciano." In 1940 David Marcus was formally appointed New York City Commissioner of Corrections. Marcus held a reserve commission as a field artillery officer, but because of his distinguished legal career, he was persuaded to transfer to the Judge Advocate General (JAG) corps. In 1940, Lt. Col. Marcus’ National Guard unit, the 27th Infantry Division, was sent to Alabama. Marcus was then the unit’s judge advocate. Legal officers were not supposed to command troops in the field, but Marcus managed to lead a unit of special troops during maneuvers in Louisiana in 1941. After the Japanese attack on Pearl Harbor on December 7, the 27th Division was sent to Hawaii. In Hawaii, Marcus organized and commanded a Ranger school, training some 8,000 men during the next year. Marcus was itching for action. He tried unsuccessfully to get the Army to give him a field command with a Ranger unit. In the spring of 1943, Marcus was posted back to the Pentagon to work at a desk job as chief of planning for the War Department’s Civil Affairs Division (CAD), under Maj. Gen. John H. Hilldring. Still itching for action, in May of 1944, Colonel Marcus convinced General Hilldring to send him to London ‘to provide liaison and act as observer in the implementation of military government policies for France.’ Marcus dealt with civil affairs questions, but then stopped communicating. Hilldring began searching from him, and learned from Lt. Gen. Walter Bedell Smith that Marcus was ’somewhere in France,’ having jumped on D-Day, June 6, with the 101st Airborne Division. At West Point Marcus had been a class of Major General Maxwell Taylor. He may have learned details of the Normandy operation from him. He "volunteered" to parachute into Normandy from a C-46, though evidently Taylor knew nothing about it. He had never jumped before. Marcus collected groups of the widely scattered paratroopers and organized patrols. He led several of those patrols, engaged in firefights with German units and, on one occasion, freeing a group of captured U.S. paratroopers. General Taylor soon met Marcus. Hilldring ordered Marcus back to Washington on no uncertain terms. After the war, General Lucius D. Clay, commander of U.S. occupation forces in Germany, requested that Marcus be assigned to his staff. Clay insisted that all senior officers in Germany were to visit the recently liberated Dachau concentration camp. Marcus was well-acquainted with Nazi wartime atrocities. But even that knowledge did not prepare him for the horrors he saw at Dachau, which no doubt influenced his thinking about Zionism. In Germany, Marcus was executive for internal affairs of the U.S. Group Control Council, then its acting chief of staff, and then the U.S. secretary general in occupied Berlin. Much of his time and energy was devoted to improving conditions for the vast numbers of displaced persons in Europe. In early 1946, General Hilldring called Marcus back to the United States and Pentagon Staff, to head the Pentagon’s War Crimes Division. Marcus selected judges, prosecutors and lawyers for the major war crimes trials in Germany and Japan. He attended the Nuremberg Trials. He was concerned to ensure complete documentation of Nazi atrocities for future generations. In 1946, the British government made Marcus an honorary member of the Order of the British Empire, ‘in recognition of the distinguished service performed…in cooperation with British armed forces during the war.’ He had been nominated for the rank of brigadier general five times. In early 1947, he was again offered the rank of Brigadier General and assignment as the military attache at the U.S. Embassy in Moscow. Marcus decided to turn down the offer and return to civilian life. Meanwhile, the leaders of the Jewish Yishuv, and particularly David Ben-Gurion, were contemplating the war that they would most certainly have to fight in the near future. Ben Gurion understood very well that the ragtag Haganah was not an army, though many of the Haganah officers did not. Tactics and training that might suffice for defending villages against irregulars or for reprisal raids would be hopeless against the invasion of trained armies that Ben Gurion anticipated. The Haganah had almost no pilots, no ship captains nor other specialists. But above all, the Haganah lacked trained officers who understood how to use infantry, artillery, armor and aircraft in coordinated attacks and defence. This was hardly surprising, since the Haganah did not have any artillery, armor or aircraft. To make up the shortage of trained manpower, the Haganah both gladly accepted and actively recruited experienced soldiers from abroad. By dribs and drabs, not quite by design, the MACHAL program came into being. Mickey Marcus was to be Israel's most famous and tragic Machal hero. The Haganah, or more properly the provisional government, sent Major Shlomo Shamir to New York to find an experienced officer or officers to train the army of the then somewhat hypothetical state of Israel. Marcus agreed to help Shamir find a volunteer. It quickly became apparent that Marcus himself was the only real candidate. That may well have been Shamir's original intent. Though Mrs Marcus was opposed, Mickey Marcus agreed. Marcus's former Pentagon bosses apparently knew of the plan, as Marcus was a reserve officer. It was discretely agreed that he could go to Palestine under the assumed name of Stone. Marcus flew to Palestine in January 1948. David Ben-Gurion, who was very much a believer in the need for a regular army, placed him directly under his command. Marcus was given the rank of "Aluf," general, and was therefore Israel's first general. Nobody else had officer ranks. Marcus visited Haganah bases, examined troop dispositions and evaluated training programs. Marcus was less than impressed by what he saw. There were no arms and no real soldiers. The Egyptians could sweep up the coast and into Jerusalem, the Jordanians could cut the country in two at Netanya. He did accustom himself a bit to the informal ways and "improvisations" of the Haganah. He was wise enough to make "recommendations" rather than trying to give orders. Marcus understood that the tiny Haganah could not then operate at the level of army corps or even divisions. He concluded that the Haganah should adopt the brigade as a basic combat formation, and thus was born the brigade structure that later served the Israeli army as well, though the structure frequently existed on paper and for non-combat organizational purposes, while attack forces might be composed of parts of different brigades. Marcus tried unsuccessfully to smuggle U.S. Army field manuals into Palestine. As that plan did not succeed, he adapted manuals from memory. Marcus's manuals stressed initiative and decisive action, characteristics of the Haganah. However, he also emphasized solid staff work at higher levels and the importance of logistics, both of which were unknown and generally ignored by mid level commanders. In his book, "Tisha Kabin" (Hebrew for Nine Measures, Tel Aviv, Israel Ministry of Defense, 1986) Yitzhak Levy, head of Haganah intelligence gave this appreciation of Mickey Marcus (pp 277-278). In the American army, David Marcus (Mickey Stone) had been divisional operations officer and commander of a Rangers training base. In the invasion of Normandy, he served as an observer in the Allied Supreme command. Of his own initiative, he joined the 101 Airborne Division, parachuted into Normandy and got battle experience. He had an education in law and served in different branches of the Pentagon, as well as taking part in the Yalta and Potsdam conferences. After the war he was appointed to the top military leadership circle in occupied Germany. In addition to his rich military and administrative experience, Marcus was blessed with a winning personality, radiating warmth, authority and trustworthiness. Though he was a student of the American military school, he adapted himself quickly to the strange, semi-professional conditions that characterized our army, and to the characteristic of innovation that served us in place of several tried and tested military axioms. The general staff believed that Marcus would be able to successfully take on the impossible task of unification of the Palmach commanders, Jewish Brigade commanders and British army veterans, and create a harmonious and uniform command. Levi was not the only one to note Marcus's extraordinary personality. Jon Kimche, then a war correspondent, wrote to Marcus's wife Emma, that when he arrived, everyone in staff headquarters was depressed. Marcus began joking with them and cheering them up, and within 24 hours morale had been restored. David Ben Gurion said that he inspired confidence from the first moment by his simple and self evident frankness. Marcus was equally impressed with the atmosphere in Israel. He wrote to a friend that this place has an atmosphere that cannot be found anywhere else on earth. It is as if you are right in the middle of the American revolution. To his wife, he wrote that he had never seen anywhere on earth a more inspired group of people than the the Israeli natives. He asserted that they are a new race of people, that a new and different sort of Jew has been born here. With the failure of the first Israeli attack on Latrun, the Haganah was motivated to find an alternative route to Jerusalem that would bypass the Latrun fortification, as well as to renew the attacks on Latrun. The alternative route, later called the Burma Road, was strongly suggested after part of the area from Hulda to Sha'ar Hagai (Bab El Wad) had been cleared completely of snipers and the Arab villages of Beit Jiz and Beit Sussin were conquered, allowing the Harel and Seventh brigades to link up. Seventh Brigade command requested a bulldozer to to improve the road to Beit Giz on May 28, and the bulldozer actually arrived and began working two days later. On the night of May 30-31, the road was used by a convoy of ten jeeps to bring supplies from Hulda to Harel Brigade. As commander of the Jerusalem Front, Marcus assumed overall responsibility for creating the road. Marcus also participated in the planning of Operation Bin Nun Bet, which failed to take Latrun on May 30, and he planned operation Yoram, which failed again to take Latrun. The faults were not in Stone's planning. Both operations were much better planned than the first operation, and there was relatively better coordination and strategy. For operation Yoram, Stone zeroed in on a defensive weakness of the Legion deployment, and planned a successful diversionary attack that gave the main assault the element of surprise. But Stone had not been able to establish a staff that would allow tracking and correction during the battles. Operational implementation and coordination was up to the commanders in the field, and this failed. In Bin Nun Bet, the infantry disappointed. In operation Yoram, artillery support and other aspects failed. Chance, the supreme general, intervened over and over, and the commanders were unable to deal with the consequences properly. According to one version (see Zabecki, 1998, here ), operation Yoram itself was planned as a diversionary attack, to keep the attention of the Jordanians away from the road the Israelis were building. Crews worked continuously on the Burma Road, named after the allied trail built to link China with Burma in World War II. In places they had to work within half a kilometer of the Arab positions. The object was to beat the cease fire deadline. If the road was in existence before the cease fire on June 11, the UN would permit it to be used. On the night of June 10/11 Colonel Mickey Marcus met his death in a tragic accident. There are several versions of what took place. Evidently, Marcus left the perimeter of the camp in Abu Ghosh, probably to relieve himself and to take a walk, dressed in a white sheet and therefore looking like an Arab in traditional dress. He notified the sentry he was going out. However, the guard was changed a bit early, at 4 A.M. On his return, he was challenged by the new sentry, who said "Atsor, Sisma" (Halt, password). Either he did not understand the sentry, or the sentry did not understand the reply. He opened fire, and then discovered to his horror that he had killed his commander. - Dedicated by his fellow members of Union Temple of Brooklyn December 9, 1949"
"His name shall be inscribed forever in the history of the Jewish people, and our heart is certain that American Jewry will be proud of its great and brave son, who gave his life for the salvation of Israel." לזכר 31450, אלוף דוד (מיקי) מרכוס, שנפל במלחמת הקוממיות, ביום ד' בסיון תש"ח (11.6.48). היה נאמן לעמו היהודי ולארצו האמריקאנית." In memory of 31450, General David (Mickey) Marcus, who fell in the war of Independence, on the fourth day of Sivan Tashach (11.6.48). He was faithful to his Jewish people and to his American country. Kibbutz Mishmar David and the neighborhood of Neve David in Tel Aviv as well as numerous streets are named after him. In 1962, Ted Berkman, wrote a biography of Marcus, "Cast a Giant Shadow," which was turned into a movie starring Kirk Douglas in 1966. * Various other sources give February 22, 1902 as his birth date. However, a comment here states: "He was born on February 23, 1901. I am a descendent of Mickey’s family (his mother, Leah Marcus nee Goldstein, and my great grandmother were sisters. I have a copy of Mickey’s birth certificate." The IDF biography gives February 22, 1901 as his birthdate. ** Wikipedia claims he was made a general on May 28. However, the IDF biography records that he was promoted posthumously. Levi, Yitzhak, "Tish'a Kabin," (Nine Measures), Tel-Aviv, Israel Defense Ministry, 1986. Zabecki, David, David "Mickey" Marcus, Military History, April 1998. Related - Col. David (Mickey) Marcus - "A soldier for all humanity"